To make this card I used a 6x6 white card base I, used a black mat to cover the base card then I cut another mat from silver glitter card. I cut a white heart from my stitched edged heart dies and I cut another from black card stock, I cut the black heart into two pieces and used half of it to mat onto the white card so as my heart would be half white and half black. I cut a frame using the heart dies from silver and glued this around my heart, I cut the bride and groom out twice one in black and one in white, I then paper pierced the white bride onto the black so my bride was in white and groom was in black. I stuck my heart onto the base card using foam tape and the stuck my bride and groom on to the heart i used wet glue for the bride and groom. 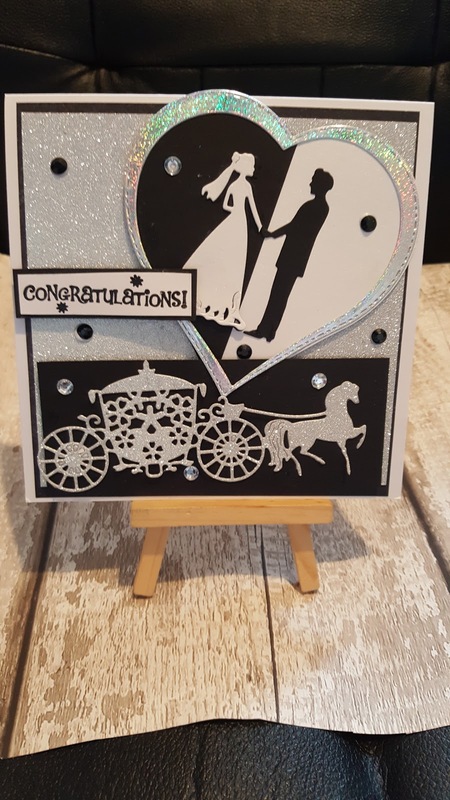 I cut the horse and carriage in the silver card, I had cut a piece of black card and stuck it across the bottom of my card using foam tape, I then stuck the horse and carriage on to this using cosmic shimmer glue, I used my sentiment and stamped it with black versafine ink and then used clear embossing powder and heat set it, I cut my sentiment and glued it on to a piece of black card and then stuck this on to my card, I decorated the card using small silver and black gems. 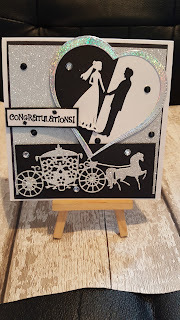 I then went over the brides dress and the sentiment with my Crafters Companion sparkle pen and my card was then finished, watch my process video above.